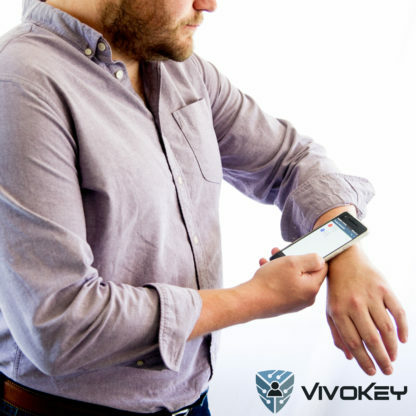 The VivoKey Flex One is the ultimate cryptobionic platform for digital identity, cryptography, and blockchain applications secured in a subdermal NFC implant. PRIVATE BETA – The Flex One is currently in private beta. The price below does not reflect the actual product price. Beta participants can obtain the beta coupon code for the Flex One from this private VivoKey forum thread. After 3 grueling years in development, we are proud to bring you the VivoKey Flex One! 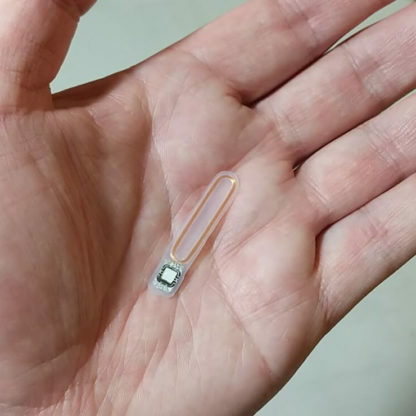 The Flex One is a patent pending subdermal secure element enabling fully autonomous separation of your cryptographic keys and functions from vulnerable general computing platforms such as your smartphone or computer. The ability to not only carry your OTP, PGP, and other cryptographic keys with you at all times, but also perform cryptographic functions in vivo (generate OTP codes, encrypt & decrypt data, etc.) without ever revealing private keys to the NFC interface you are interacting with is a huge step forward for personal digital identity and data security. The Flex One will require the specific and specialized installation services of a medical professional or body modification artist skilled in tissue manipulation. The Flex One is approximately 8mm wide by 38mm long, with a thickness of 0.4mm. The standard installation method will be to make a scalpel incision between 8mm and 10mm long. Next, a dermal elevator will need to be used to separate fascia tissue, creating a channel or pocket between dermis and muscle tissue that is approximately 8mm wide by 45mm long. The extra length will be required to allow sufficient space to allow safe suturing after placement. Once a sufficient channel is made, using sterile gloves pick up the Flex One and insert into the channel by hand. Do not use tools (such as forceps) to handle or place the Flex One. Once the Flex One is placed fully into the channel, carefully suture to close. Once you have your Flex One installed, grab your Android phone. install the Fidesmo app. Open the Fidesmo app and scan your VivoKey Flex One, and you will see a list of supported applets you can deploy on your Flex One. Applets are available from multiple vendors on the Fidesmo platform, and VivoKey also publishes their own applets such as our OTP applet and our NDEF applet.